zur Info und Veröffentlichung auf der IOI Homepage. Liebe Grüße aus dem kalten Schwarzwald! Noticed that Norman (Averisera) had mentioned us on your website. 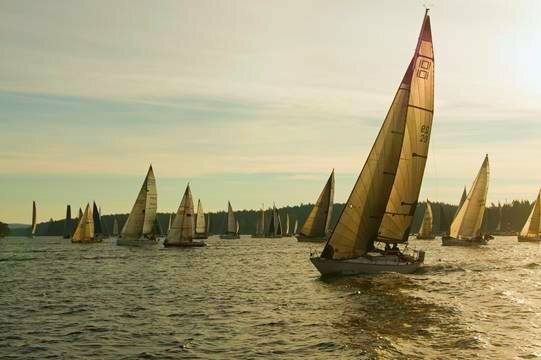 My wife Megan and I own #29 and cruise/race her on the Puget Sound (Link zu Google Maps). Our 101 was originally owned by the individual who was responsible for importing the 101's to this area. I believe about 10-12 boats were imported, several have gone north to Canada or south to California and one is now in Coeur d'Alene, Idaho. There are three more 101's in our marina, and two more in marinas to the south of us. Currently only our boat and one to the south is being raced actively. I'm attaching a photo of us at the Round the County race which is a two day race around the San Juan islands. Happy sailing!